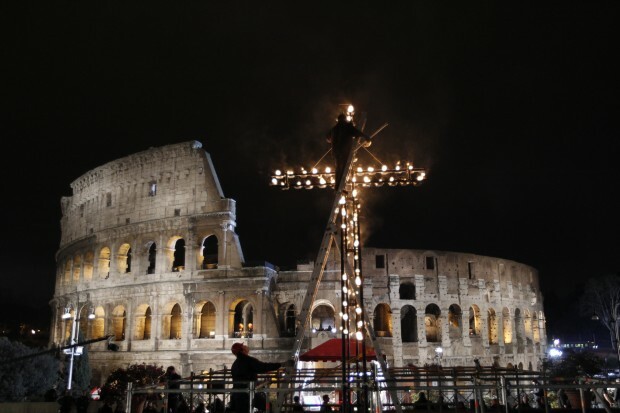 The Good Friday service, which takes places at night at Rome’s Colosseum, is broadcast around the world. Tens of thousands of people gather with the pope around the ancient Roman amphitheater to meditate on the last moments of Jesus’ life. Each year the pope asks a different person to write the meditations and prayers that are read out after each station is announced. Cardinal Bassetti was chosen for the March 25 service. “For every station I tried to make a reference to current events because, as Pope Francis says, ‘God is real and shows himself today,'” the cardinal told the Vatican newspaper, L’Osservatore Romano. Reflecting on Christ’s passion, the cardinal also urged people to reflect on how human sin and suffering continue today. His meditations refer to modern martyrs being killed “in every corner of the globe” just because they are Christians. He refers to the suffering of migrants and refugees fleeing poverty and persecution but risking disease and death as they make the perilous journey toward a new life. Reading and praying about the stations in preparation for writing, the cardinal said he was struck particularly by portrayals of the use and abuse of power. The Vatican publishing house, Libreria Editrice Vaticana, printed booklets with the complete texts of the prayers and meditations. They were to be handed out free of charge to people joining the pope at the Colosseum and available for sale at the Vatican bookstore. By participating in the Via Crucis service and remembering Christ’s passion, Christians assert their faith that suffering is not absurd and that, in the end, Christ is victorious over both evil and death, Cardinal Bassetti told L’Osservatore Romano. Most of the cardinal’s meditations and prayers were designed to help Catholics recognize how much they need God’s mercy, the great cost paid by Jesus for their salvation and how Christ continues to suffer today in the lives of so many people. The prayers for the seventh and ninth stations, when Jesus falls again, are likewise prayers for lists of people who find themselves thrown or pushed down to the ground under the weight of almost unbearable suffering: abused women, orphans, those whose families have broken up and the unemployed.